B.J. 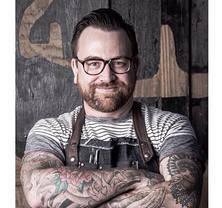 Smith, “Top Chef Season 14” contestant, is the Owner and Executive Chef of Smokehouse Tavern and Kim Jong Smokehouse in Portland, Oregon as well as the newest Smokehouse location, Smokehouse Provisions, in Vancouver, Washington. Smith brings more than two decades of culinary experience to his role, applying both classic and modern cooking techniques to high quality ingredients. Smith conceived Smokehouse in 2010 as a way to apply all he had learned in his fine dining cooking career, but deliver an approachable menu where guests can get their hands dirty and reminisce over food as though at a good friend’s BBQ. His first location, Smokehouse 21, located in Northwest Portland, debuted in November of 2011, followed by Smokehouse Tavern in 2015, Vancouver’s Smokehouse Provisions in 2016 and Kim Jong Smokehouse in 2016. He recently announced he will be closing Smokehouse Tavern to open Delores, a Polish-focused restaurant in Buckman. "Fried Brussels sprouts, sous vide egg, furikake, bonito, fish sauce vinaigrette. I’ll be @scottvivian all night!" "41 is off to a great start! Thanks @mikolaaaaa"
"Sunday lunch. • • • • #tasty"
"Breakfast Tacos Daily. @smokehousetavern. @smokehouse.provisions. • • • • #tasty"
"Smoked corn, kim chee mayo, gochugaru, lime, parmesan. • • • • #tasty"
"Cheesy corn with kim chee and smoked galbi brisket. • • • • #tasty"
"Breakfast tacos. Pulled pork, beef brisket or avocado. • • • • #tasty"
"Cold smoked oyster shooters, BBQ cocktail sauce. • • • • #tasty"